Djibouti, 250 francs, 2012. Djibouti francolin. Dominica, 20 dollars, 1978. 50th anniversary of the Graf Zeppelin. A strange subject for Dominica, though. The Ciudad Mitad del Mundo (Spanish: Middle of the World City) is a tract of land owned by the prefecture of the province of Pichincha, Ecuador. It is located at San Antonio parish of the canton of Quito, 26 km north of the center of Quito. The grounds contain the Museo Etnográfico Mitad del Mundo, a museum about the indigenous ethnography of Ecuador. The 3-meter-tall monument was constructed between 1979 and 1982 by Pichincha's Province Council to replace an older, smaller monument built by Government of Ecuador under the direction of the geographer Luis Tufiño in 1936. It is made of iron and concrete and covered with cut and polished andesite stone. The monument was built to commemorate the first Geodesic Mission of the French Academy of Sciences, led by Louis Godin, Pierre Bouguer and Charles Marie de La Condamine, who, in the year 1736, conducted experiments to test the flattening at the poles of the characteristic shape of the Earth, by comparing the distance between a degree meridian in the equatorial zone to another level measured in Sweden. The older monument was moved 7 km to a small town near there called Calacalí. Based on data obtained by Tufiño, it was believed that the equator passed through those two sites. However, according to readings based on the World Geodetic System WGS84, used in modern GPS systems and GIS products, the equator actually lies about 240 meters north of the marked line. Egypt, 5 pounds, 1991. Gizah Zoo. I'm looking at the design on the left. And see how the animals all posed nicely without attacking each other. El Salvador, 5 colones, 1997. Collector coin. Equatorial Guinea, 10 ekuele, 1975. Here I am focusing on the quaint chicken, though the human portrait is nicely done too. Eastern Caribbean States, 2000 cents, Year 2000. A symbolic scene for the new Millennium, by Robert Elderton. Here I have briefly backtracked to the East Caribbean States. Inevitably I will get the odd country in the wrong order. The common obverse of these collector coins featured an attractive scene with a camel and a dhow. Eritrea's circulation coinage was not issued until 1997. See: Coins of modern Eritrea. Estonia, 1 kroon, 1934. Has Estonia ever produced a better design than this Viking ship? Ethiopia, $20, 1966. Emperor Haile Selassie in full regalia. 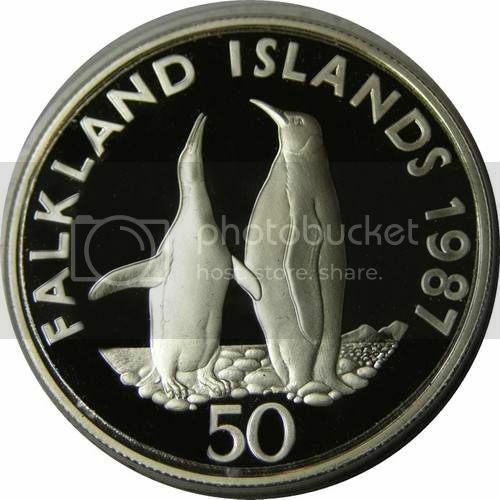 Falkland Islands, 50 pence, 1987. King penguins. WWF commemorative. Who would have guessed that the Falkland Islands have penguins? Falklanders living near the jungle are regularly attacked by herds of giant ones. Fiji, 10 cents. Flying fox bat. The only regular circulation coin featuring a realistic bat. I believe some of Macao's coins featured a heavily stylised bat in the 1980s - little more than an outline. But which alignment / orientation does this coin come in? ↑↑ ↑↓ - or both? Finland, 5, markkaa 1984. Icebreaker "Urho". I prefer this design to the Icebreaker "Varma" design. France, 10 francs, 1951. This little cockerel design is full of character and quintessentially French.